final horse inspection at Foxhall. I am a desk jockey, a quintessential weekend warrior. During the week I'm a computer programmer, but on the weekends, for about the past year, I've been putting aside the computer geek persona to groom for Phyllis Dawson. I was lucky enough to be her groom at the inaugural Foxhall Cup three-day event. I had only ever groomed at 2 other 3 day events, a one star and a 2 star, so I was really excited to be moving up, as it were, to a three star event. But I was nervous too. I was nervous about being in charge of packing for the vet box, I was nervous about the three star atmosphere, and most of all I was nervous about the braiding. I don't do much braiding as Phyllis' other groom, Amanda, usually does it and she does it so well. But Amanda wouldn't be joining us until Saturday, cross-country day, which meant that I was on my own for the first jog and for dressage! But in the week before the event, I put my nervousness aside and planned. I searched out the Foxhall Cup website for information about the event and the area, I scanned the hotel website for information about our accommodations. I practiced my braiding skills under Amanda's experienced eye, and I got loads of advice from people who had groomed for Phyllis at 3-days in the past. I worked like crazy at my real job as unexpected glitches threatened to prevent this scheduled vacation. Finally, glitches solved and packed and prepared for every contingency, Monday arrived, our traveling day. It was still dark when I climbed into the truck between Phyllis and Jane Sleeper, whose pretty gray horse, McKloud was to be Star Bright's traveling companion for the trip. I was as antsy as a little kid at the start of a long trip and though Phyllis and Jane made for excellent company, Northern Virginia is a very long way from Atlanta! After a blessedly uneventful journey, we pulled into the brand new stabling area at Foxhall Farm. Both horses had traveled well and were happy to be at the event. The best thing about being a groom is getting to know the horses so well. Bright is a wonderful horse to groom for. I had groomed for him all last fall and this spring at the preparatory horse trials, and I really adore him. He is kind and gentle, so eager to please and easy to be around even when very fit that looking after him is a joy. He decided early on, however, that the bugs down in Georgia were much more fierce than our Virginia variety, and he trembled if one so much as flew near him. Truth be told, he doesn't actually like the Virginia variety that much either! The next day was quiet and relaxing. Bright enjoyed a nice hack and I cleaned and organized our tack stall and wandered around the grounds to familiarize myself with the area. The volunteers and staff were friendly and helpful, and possibly even more excited than I was that the inaugural Foxhall Cup was under way. Foxhall is beautiful, no two ways about it. The stabling area is up on a hill and is positively picturesque with the main stone barn overlooking a small lake. The cross-country course, the main arena and the all important vendor tents were nestled down the hill close to the Chattahoochee River. I knew that Foxhall was billed as an ideal spectator course, but as I checked out the grandstand, I was amazed to discover just how many of the cross-country fences I could see. It had to be nearly three fourths of the course! The stabling area is quite far from the main arena, and the horse path goes up a fairly steep hill and then back down. As I'm trying to remember, Phyllis now says it was a half-mile at most, but I contend that it was at least a mile. It definitely seems like a mile leading a frisky, fit horse, especially going up that hill! Note to future Foxhall grooms: the golf carts that are available for rent are well worth the money! The jog, or First Horse Inspection as it is formally known, was held on Wednesday. I spent the better part of the morning bathing Bright and worrying about braiding him. Quite possibly the most stressful moment of the entire week, at least for me, was when I first stood on that bucket to begin braiding Bright for the jog. I was afraid that I wouldn't be able to do him justice. I was so nervous that I kept forgetting things, first the sponge, then the scissors for cutting the thread, and then even the needle itself! As I fussed and bustled around, Bright watched me tolerantly, seeming certain that eventually I would get around to the business of braiding him. At last I got it together and he was shined, braided and ready to go. Phyllis took Bright in hand while I followed with the supplies we'd need at the jog: a soft brush for the last minute touch-up, a wet towel for any unexpected or previously missed stain, a hoof pick in case he picked up a stone on the way down, and fly spray because Bright is sure he will spontaneously combust if a fly touches him. I loved the jog. I loved the atmosphere, all the potential and nervousness in the air, the horses positively glowing, fit, and eager to be at work. It is a tense time at any three-day, for here a horse can be spun from the competition before it has even really begun. I wasn't worried about Bright though, for he was in top form. I jogged Bright for Phyllis to watch. He surged forward in medium trot and I struggled to keep up, while Phyllis called “Faster, faster….” Hang on, this weekend warrior is trying, I'd already done more exercise that day than I'd done the previous week put together! As the sky darkened and storm clouds threatened, Bright was called to jog. I experienced an unmatched moment of pride as I watched him go. I did him justice after all. He looked every inch the stunning horse that he is. Just after his jog, they called a pause to the proceedings to allow the sudden storm to pass. The horses who were yet to jog were taken to the vendor's tent to wait out the storm. Phyllis didn't think that a tent full of fit horses in a thunderstorm looked like a good place for Bright to be, so we hightailed it back to the stabling area. I was chugging along with my bucket of goodies and huge drops of rain began falling so hard that it actually hurt to hit the skin. A kind stranger stopped to give me a lift in his truck – boy was I glad to see him! So my first official day as Bright's groom went well, even if it did end with a bang. The rain on course was much needed, and much appreciated by all the competitors. Bright's dressage was the next day at a tolerable mid-morning time. He got another bath and braiding job, only this time I was much more relaxed since I knew I could do it. Bright put in a wonderful test to stand sixth after dressage, and I experienced another burst of pride watching them. Ok, so I didn't have anything to do with the excellent ride Phyllis gave him, but surely I get points for making him look so darn good doing it! On Friday, I finally got to see the course. Phyllis and Jane went to walk the course and let their grooms tag along. From the perspective of someone who never aspires to ride above training level, the course looked unbelievable. People have since said that it was a bit of a soft course for a three star, but I was in awe of it. There was this one jump, late in the course, called the dam jump, where they seemed to practically drop off a cliff! Ok, maybe not a cliff, but it was a very, very steep hill. The horses had to drop off a bank, bounce over a brush fence and then gallop straight downhill to another, sizeable brush fence. Phyllis and Jane assured me that there were other more difficult fences, but that one looked pretty “dam” amazing to me. Friday evening, using a handy list from Phyllis' barn manager, I packed supplies for the 10-minute box, for steeplechase, and for the new C 10-minute box. I took Bright out for a late handgraze, and I remember how he shined even in the fading light. I found my first ever four-leaf clover and fed it to him for luck. Bright seemed especially keen on the morning of cross-country, he seemed really aware that the big day was finally at hand. We had extra help for this day, Phyllis' farrier Stephen Mayer and her other groom, Amanda Draper. Together Amanda and I got the supplies to the 10-minute boxes and sorted out who was going to be where and when so that we had the right amount of help at each stopping point for Bright. The atmosphere at the barn was positively electric as horses and riders began to go out on phase A, the first roads and tracks. Bright himself was very quiet as I tacked him, but he was brimming with energy. And then they were off, and the next hour went faster than any other time I have ever spent in my life. Amanda, Steve and I caught the shuttle down to the 10-minute box. From there I went to the Steeplechase assistance area and Amanda and Steve went to the C 10-minute box to take care of Bright when he came in there. I got to watch Bright steeplechase. He was prancing as he waited his turn, and then, out of the startbox, he lengthened into a ground-covering gallop. He was hot and puffing when he finished and came into the assistance area, so I put cold water on him and checked to make sure he had all his shoes, then they were off on Phase C, and I was running back to the 10-minute box. The 10-minute box, or vet box, as it's sometimes called, was absolutely the shortest 10 minutes of my life. Bright came in, we haltered him, loosened his tack, the vets took his temperature, pulse and respiration, and we put ice water on him while standing in a tent in front of a misting fan. We walked and sponged, walked and sponged, the vets checked his TPR again, then suddenly it seemed, it was time to dry him, grease his legs, and jog him for the vets for soundness. Then Phyllis was on him and heading to the start box. Foxhall is good for spectators, and that includes the grooms who are stuck in the vet box. I got to see an amazing amount of Phyllis' ride, including the main water and the double corners. They looked fantastic! Then they were coming into the finish, both horse and rider pleased with their efforts. Bright was so sure he'd done well. As I led him back up over the "mountain" as I had come to call it, he was by turns affectionate and exuberant. I huffed and puffed along beside him while he pranced and cantered in place, once even swapping leads without ever pulling on the shank. I laughed at him and rubbed his face. Back at the stable I made sure he had hay and water, fed him a bit of grain, and just sat and watched him. He munched quietly, and much to my pleasure, drank nearly a full bucket of water. Everyone in our little area was still off at the competition, so the place was peaceful, only the announcer's commentary giving a hint of the action still going on below. Finally, sure that Bright was resting comfortably, I headed back down to watch the show. Since we were done fairly early in the day, we got to see many of the last riders go, which for a groom, is a real treat. Foxhall threw a party that night, with excellent food and drink. For those who don't know, as I didn't, eventers really let their hair down the night after cross-country. I had a great time, got to see a side of the event world that I didn't even know existed. A word of caution to the uninitiated: never get on a golf cart with someone at the wheel who is not afraid to jump four foot high solid objects on a horse traveling at 600 meters per minute unless you want to take your self-preservation instincts out for a spin! The next day we were back to business with the final horse inspection and show jumping. I gratefully left the braiding to Amanda's more experienced hands, and busied myself with tack cleaning and brass polishing. I wanted Bright to shine just as much the last day as he did the first - and he did! He jogged up beautifully. Getting him back to the stable was a bit more difficult than it had been the previous day when he was tired from having worked. The horse path traveled by the first jump on cross-country and there was a group of runners warming up for the 5K run Foxhall was hosting for the day. None of them knew anything about horses and they were jumping on and off the first fence, not even noticing how they were startling the horses who were passing. Bright thought this was most erratic behavior for a human and tried to show them his belly button, but we managed to pass by without incident. Show jumping runs in reverse order of standing which meant since Bright was in sixth place, he'd be near the last to go. We got to watch the early riders show jump, another real treat for a groom. The crowd was very funny to me. There were a lot of non-eventers in the crowd, and one lady even told me that she and her husband picked show-jumping day to come because it was something she had heard of. In the early part of the day, the crowd cheered for absolutely every fence that didn't have a rail, having no clue that the noise might be distracting. Once, when a rider took a tumble, the crowd cheered when she got up, startling her standing horse into trotting off. Even though it was difficult for some of the horses and riders, I thought it was great that so many of the people who had come to watch were not horsey types. I hope they had a good time and told all their friends how exciting it was so there will be even more of them next year. Midway through the show jumping there was a sort of a half-time parade of the horses who had yet to go. Afterward, we were to put his studs in and walk him around until it was time for Phyllis to get on to warm up, at which point Bright and I became a small sideshow attraction. We were outside the main arena but behind the ropes that separated us from the spectators. There were big fans going, and spectators milled around the area. In short, it was a lot of atmosphere. Just as I needed to put in his studs, he began pulling a rare "I'm a fit event horse" routine. I had one hind hoof partially tapped, tap still screwed in when Bright began jerking the leg around, hopping on his other three legs, lifting me off the ground as Amanda tried to steady him. I hung on desperately, working to unscrew the tap, nightmare visions playing out in my head of having to tell Phyllis that we were going to have to have the horse reshod just before show jumping because he'd stood on the tap and broken it off in the shoe! Fortunately it was a Safe-T-Tap, less likely to break off if a horse stood on it, and just as important for me that day, a whole lot easier to grip even when being dragged around the grounds by a 1200 pound horse. I breathed a huge sigh of relief when I freed the tap and was able to release Bright's hoof. When I turned around to look at him, I caught a glimpse of the horrified faces of the small crowd we'd drawn. I heard a little girl's excited whisper, “What's she doing to the horsey, Daddy?” Her father responded knowingly, “Horse's feet are very delicate, and she's using those tools to fix them.” Well…the first part is true enough anyway! I wanted to explain; it wasn't so long ago that I might have thought the very same thing after all, but I had four more studs to get in on a horse who had run out of patience. 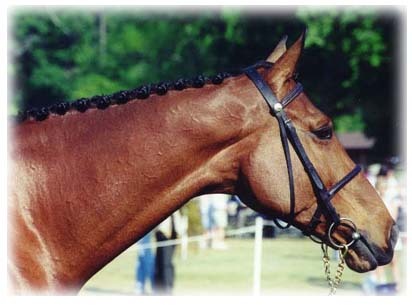 Bright had rails in show jumping, which dropped him to 10th place, keeping him in the ribbons. During the victory gallop, the crowd clapped and the horses all looked magnificent cantering around the main arena on such a sunny May day. Bright was positive that they were all clapping for him. His groom certainly was, I clapped like crazy for him. As I'm writing this four months later, I realize that I really only remember the good parts. I know that it was hot that week, but I don't really remember the heat. I know that I was tired packing up that night, and I must have been bone weary when I slid into my desk on Monday morning after having driven all night to get back to Virginia. But that's not what Foxhall was to me. What has stayed with me are the handgrazes at dawn, Bright's quiet tolerance of my first fumbling braid job, the way he would rest his head on my shoulder if I slipped into his stall for a hug, and that feeling awe as I watched him gallop around the cross country course. I remember sitting down to lunch after dressage and hearing someone I didn't know tell Phyllis that Bright was just the most stunning horse she'd ever seen. I remember that there was always free food and drink to be had in the rider's lounge as well as a friendly face for a chat. I met the nicest people at Foxhall, from other riders and grooms and owners, to the excellent staff and volunteers who worked so hard to make the event go smoothly. Those are the memories I keep.